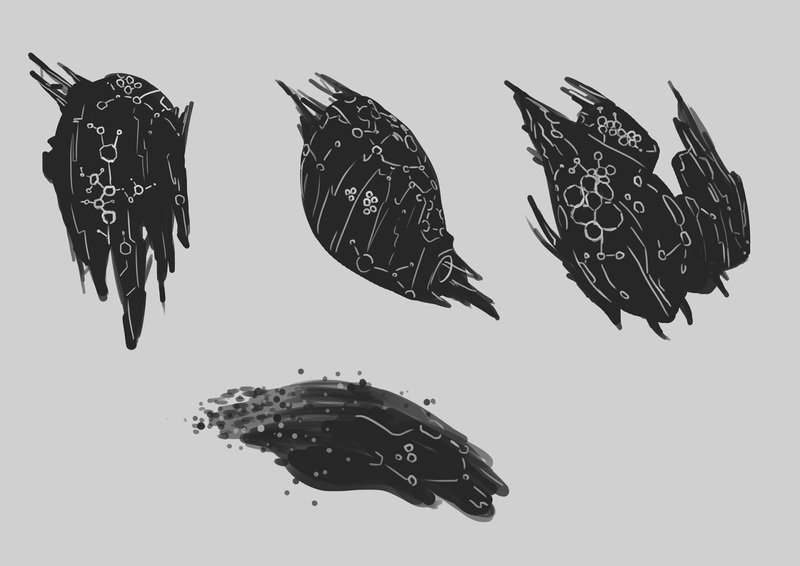 These quick sketches spawned some interesting ideas. I found it was difficult to move away from a very organic and literal insect design. I was incorporating rigid edges to try and give to some extent a machine built and synthetic look, however, from a distance the mechanical nature of the some of the designs is hard to see. 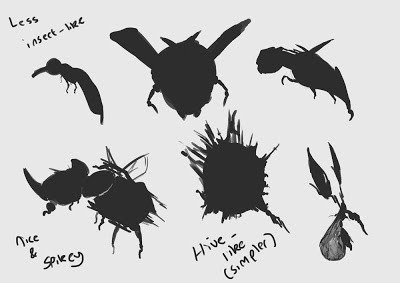 Particularly the first design at the top left, the rhino beetle design bellow that and finally the very design on the bottom right. The final design however did offer an interesting concept. 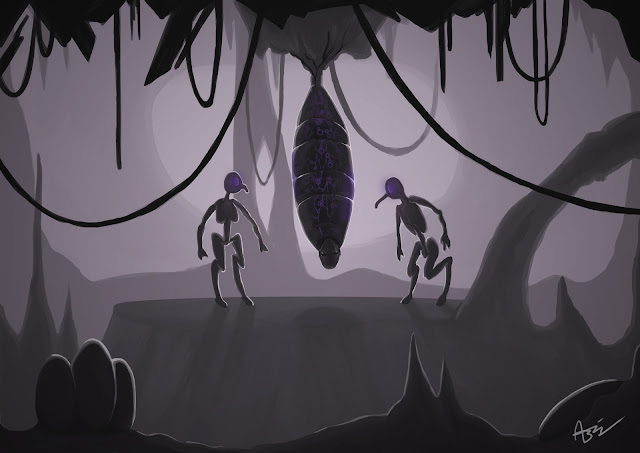 I have known from the beginning I want to achieve a balance between synthetic and organic materials with my alien race. This particular final design shows a winged rigid craft carrying a very repulsive organic kind of sack. I thought perhaps this could be used to store the collected abductees. On reflection however, the middle design on the bottom row seemed the most realistic approach considering my limited abilities in 3D modelling and animating. 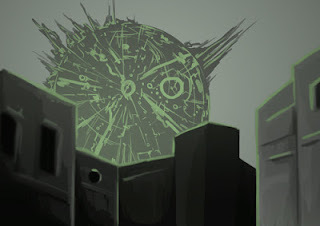 I thought this ominous floating ball could appear more as a hive as oppose to a mechanical insect. 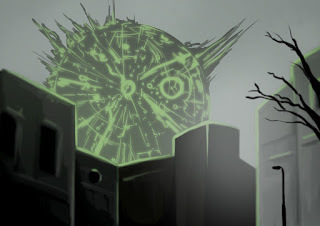 I don't feel this would take away from the final result with the simple approach, as the looming ball would appear more haunting, slowly emerging from behind the building plate shot footage our group collected. For this concept to have the correct effect, it would need to be large in scale. I am reminded of films such as 'District 9' and 'Independence Day' where enormous crafts consume the sky above cities. My UFO perhaps won't be this large, as I imagine it could require some very detailed and time consuming textures. Still, the craft will be much greater in scale in comparison to my other agile lightweight silhouettes, which would have more likely swooped through the city grabbing victims. When I am working within the concept art phase of a project, if an idea emerges, however simple and unrefined it may be, I like to jump into Photoshop and capture the idea in the form of a detailed painting. I feel this helps me keep inspired and motivated to continue developing my work. It almost helps inform future ideas. I can then later consider bringing in more reference images to refine and build on my approach. I felt I began working quite efficiently, using layer masks to refine the edges of layers and save time when making adjustments (painting details, adding shadows/highlights). 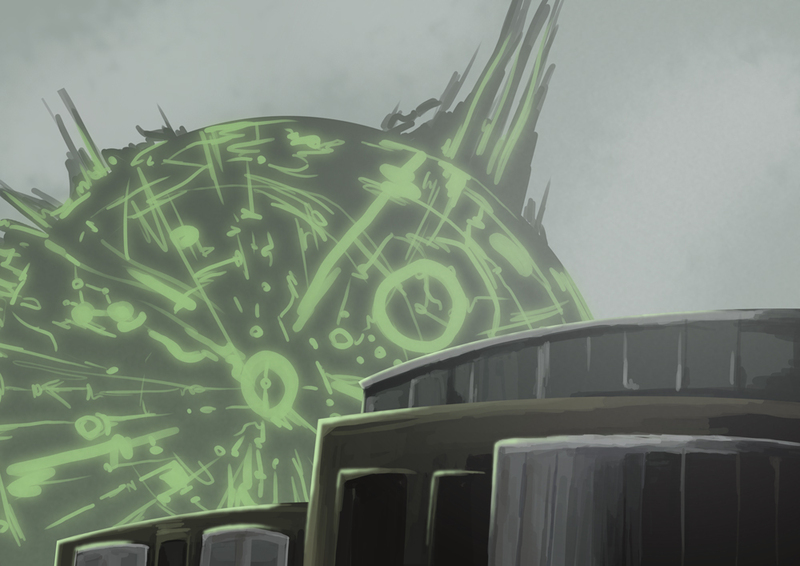 One mistake I did make was painting the green edge lights on the same layer as the buildings in the foreground. This meant that if I wanted to tweak the levels of the buildings to bring out the UFO in the backdrop (which I frequently did) The intensity of the highlights would also be effected. I did add a separate layer and redo the highlights, applying the same layer mask as the buildings layer below. This did slow down the process, where speed and efficiency is an area I am constantly trying to build on. Although I was more satisfied with this result, I still am still not completely thrilled with this particular piece of concept art. Never the less, to some extend it captured my very loose idea and I felt it was time to move on. 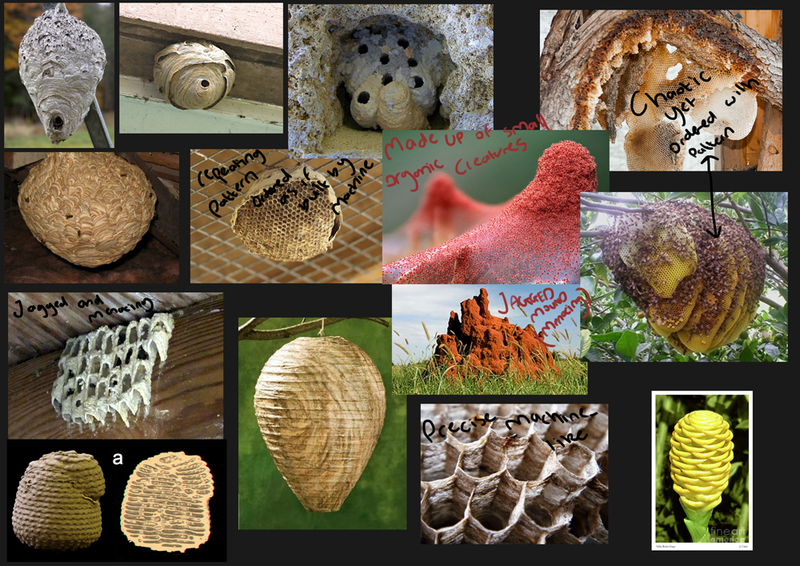 With these designs, I tried to capture the wild, chaotic forms of the wasp's nests and termite mounds in my moodboard, combined with very ordered and structure light patterns, reflecting with order of the bee's nests. You can see with the final image at the bottom of the designs, I have considered the craft consisting of tiny machines, Trailing off at the rear of the designs. This also reflects an insect swarm, fitting with the theme of my project. I found I liked the very first design. 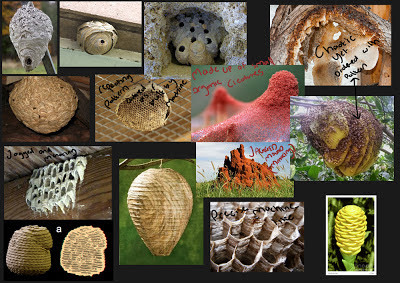 It reflects the hanging finger-like wasp's nest images I collected, and can also be likened to the termite mound image which reflects this organic un-ordered exterior I now wish to achieve. 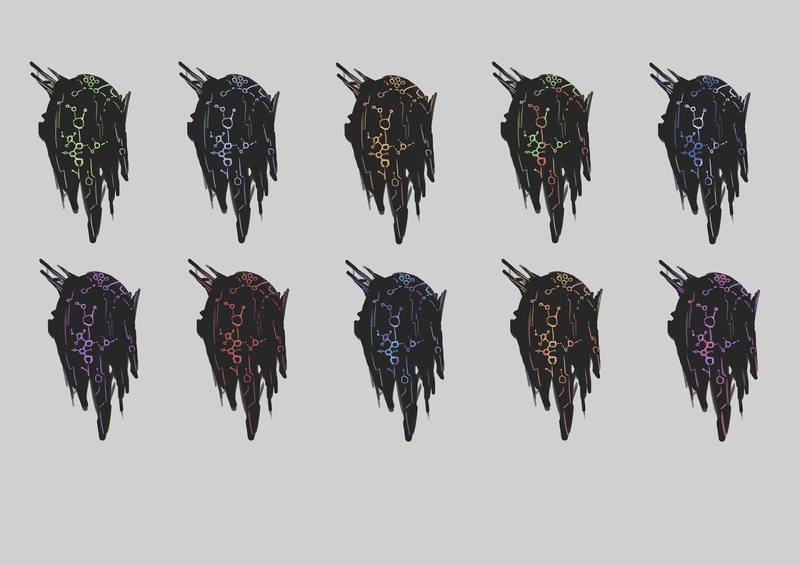 I tried a wide array of colours. Greens inspired by my initial vision (possibly influenced by my last project). Mass Effect 'Husk' inspired blues from my initial moodboard. Sinister reds and intense volcanic oranges, and combined colour experiments. I actually liked the blue and purple approach. I associate this combination with the night, which leads me to think they will work well in my dark mysterious interior. I also find purple very regal yet sinister. It is often assumed to be a very luxurious colour, yet with it's shady night-time connotations, it sits very uneasily with me, making it a great choice for my sinister alien race. If I wanted to portray these insect creatures as brutish and ruthlessly violent, a loud red would have been the choice. I feel the refined and more subtle nature of the colour purple portrays my aliens as clever and cynical, showing no remorse or empathy towards humans while conducting their experiments. It was interesting to consider one of my paintings in a cinematic sense. It meant that I was really able to begin considering how the finished shot will look, feel and sound in the early development stage. I also feel it is a good method of showing my work in an interesting visual manner which could possibly be presented in a showreel.